My kids love their phones! Evidence presented below. Recently during a nice family dinner outing only one of the kids was actually focusing on eating. The other two were more interested in checking out their phones. This one was more interested in the food. Are your kids phone obsessed also? Or maybe your significant other or best friend is. Or, just admit it, maybe you are? If you or a loved one received a new fab phone over the holidays you know how important it is to accessorize properly! It is not too late to buy a phone case that reflects your own personal style. Cellairis has an immense selection of other phone cases in a variety of colors, patterns, finishes and sizes..... a little something for everyone. I have an iphone 4s and Cellairis has a huge selection of iphone 4/4s cases. The fine folks at Cellairis actually picked out my phone case for review and I honestly could not have done better myself. This is SO me. I loved loved loved this phone case. Yes, I loved it.... I tend to dress conservatively (aka boring) so love to add something sparkly, shiny or tacky jazz things up a bit. It may be nail poish, jewelry or another accessory. This Bella (electrify) phone case is perfect. 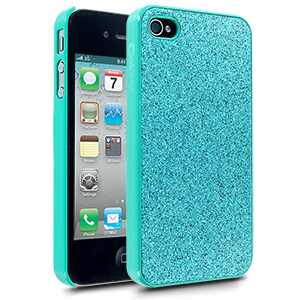 The case is glittery and fun and the color is just perfect. Ms N. and my NEW phone case. SNAZZY!! The phone case fit perfectly; because it was a slim fit, it was easier to manipulate the on/off button and the volume control / muting function. Another thing Miss N. and I both noted was that even though the phone case was glittery, and looked like it would have a gritty texture, the back was instead slick and smooth. This really is a fabulous phone case and I would not hesitate to recommend it. Want something a little more personal? Cellairis also offers personalized phone cases at their sister site "Shout!" You can order a custom case with your favorite photo. You can even upload your photos right from Instagram or Facebook! I hope that you have fun looking over the selection at Cellaris. Warning! Once you start looking you may not be able to stop. If you do decide to select your own lovely phone case, you will not have to wait long at all.... Cases are delivered in 72 hours! Have fun shopping and let me know if you purchase a statement piece of your own. Disclosure: I received a product sample for review purposes. I did not receive any monetary compensation for this post nor was I required to write a positive review. All opinions expressed are my own. Please see disclosure policy posted on site for more information.